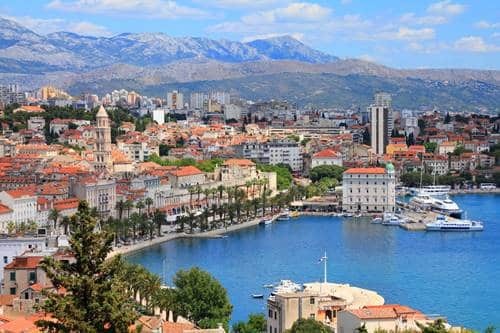 Croatia’s second largest city, Split, is also the capital of the Dalmatia region. 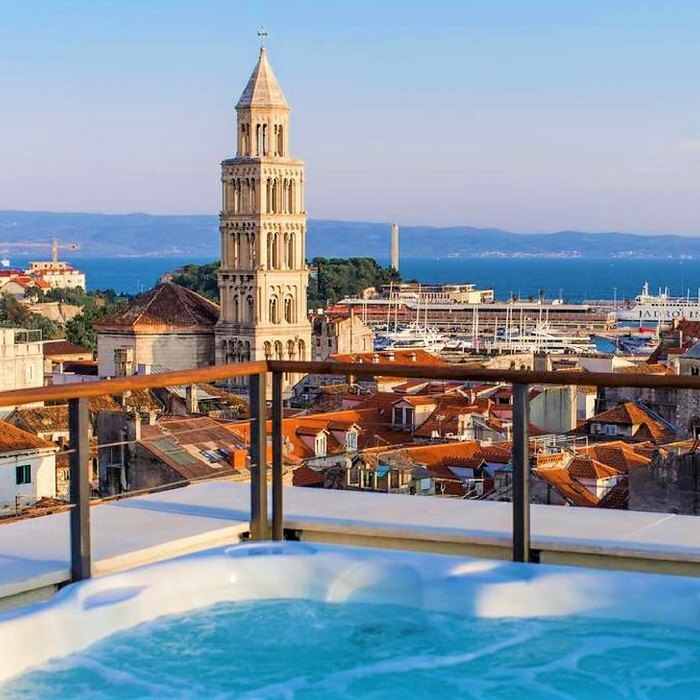 The historic city is best known as the location of the iconic UNESCO World Heritage site of Diocletian’s Palace. The palace is one of the finest and most well preserved palatial structures in the world. It is also Split’s number one tourist attraction! 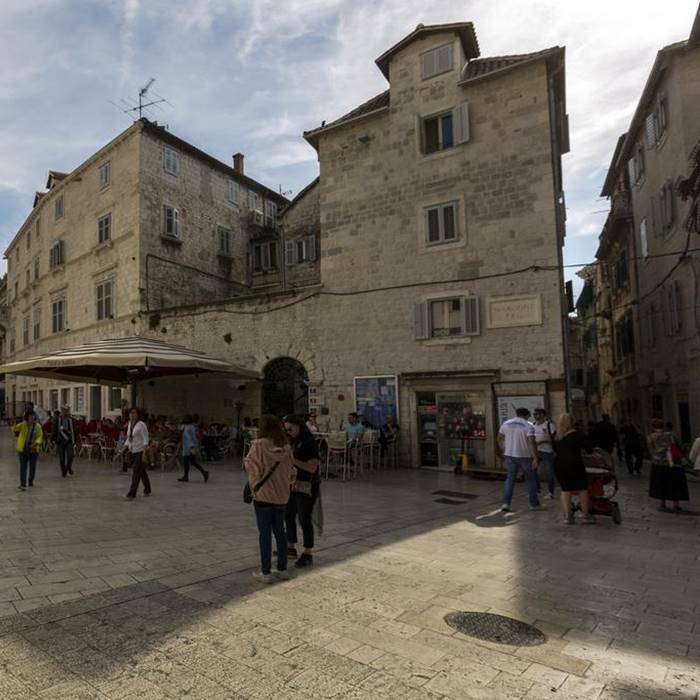 The magnificent and sprawling white stone Diocletian’s Palace was built as a retirement home for the Roman Emperor in the 4th century, today it houses a cathedral, Gothic and Renaissance palaces and churches, and 200 buildings that include shops, cafes and restaurants. Split isn’t solely famous for its UNESCO listed site. The elegant palm tree lined waterfront Riva promenade is another popular landmark attraction that draws plenty of tourists. Visit the Mestrovic Gallery to see some fine examples of the work of Croatia’s greatest sculptor. Soak up the lively atmosphere of the city at the Green Market. Split Market is regarded as something of a local instituition and is worth a visit even if you don’t actually buy anything. When you’re feeling hungry, grab an authentic taste of Split at one of the friendly, local family-run eateries. Split has a great selection of gastronomic delights that you can sample at lunch or dinner time. If you want to escape the hustle and bustle, you can find an idyllic piece of paradise on Bacvice Beach. The city beach may be a little compact in size, but it’s perfect for the locals and visitors alike. The shingle beach is lined with cafes, bars and nightclubs. For the best scenic views in the city, head for Marjan. The pine forest covered beauty spot is Split peninsula’s hilly green tip and the city’s biggest natural recreational area. 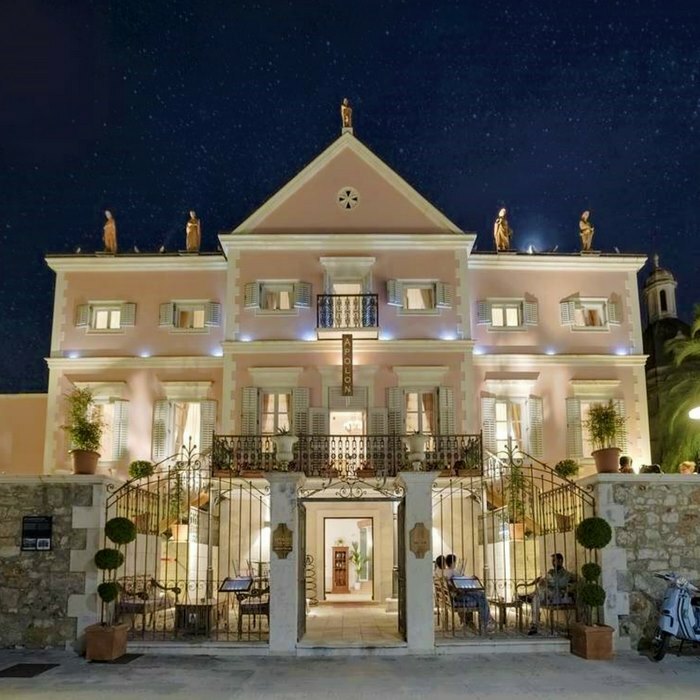 It boasts winding paths, a collection of historic medieval churches, and breathtaking views that are panoramic and unmissable. The fascinating ancient city of Split is home to one of the most well preserved Roman palaces in the world. 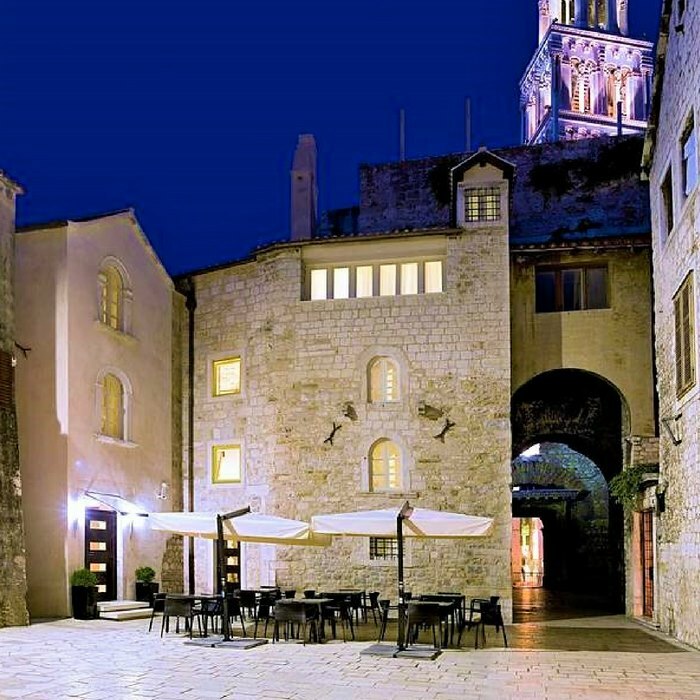 The iconic UNESCO World Heritage site of Diocletian’s Palace is very much the heart of the historic Old Town. The palatial site is a sprawling labyrinth that boasts an eclectic mix of Roman temples, Gothic palaces and modern Mediterranean-style stone houses. Providing a scenic contrast from the city’s rich history is the palm tree lined, waterfront Riva promenade that is also definitely worth exploring. Situated on the peninsula of the city of Sthe gate. 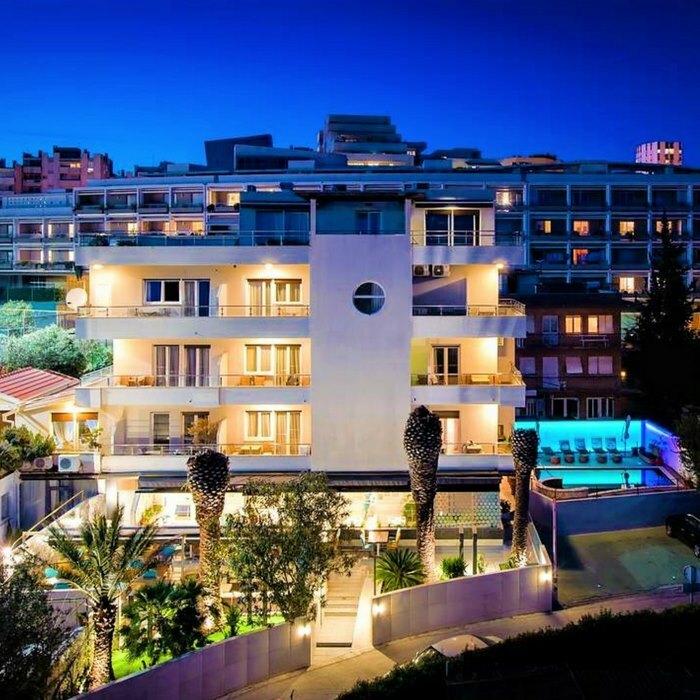 Make your way through the fragrant Mediterranean pine forest and climb to the top of Marjan, for breathtaking panoramic views of Split’s Old Town and the Riva promenade. In the surrounding area, there are a number of beautiful beaches where you can sunbathe or swim in the crystalline turquoise waters. 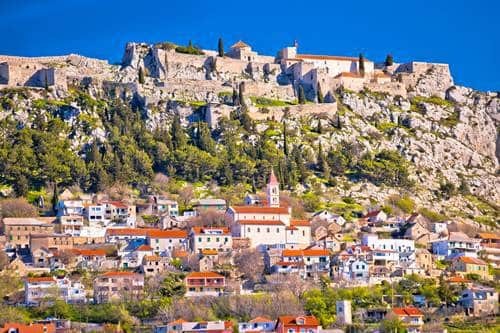 Built in 3rd century BC, Klis Fortress has long been the home of Croatian kings, and was originally constructed to provide protection of the valuable local area, and Klis village. Much of what remains of the fortress dates back to the period of Venetian rule. The medieval fortress has become a popular place to visit due to featuring as a location in the hit TV show Games of Thrones. Climb to the top of the fortress for the best photo opportunities. 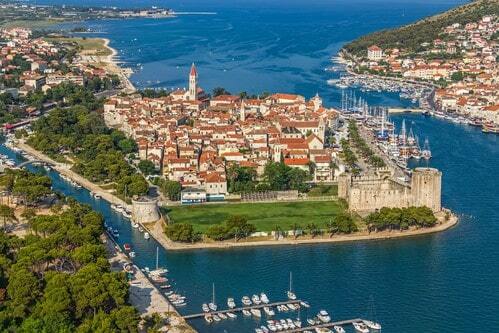 The quaint medieval town of Trogir is situated on a tiny island that is connected to the Croatian mainland via a bridge. The humble little town boasts impressive UNESCO World Heritage site status. Take walk along the cobblestone streets and admire the preserved Kamerlengo Castle and its tower. Located nearby, there are palaces and dwellings that showcase the Romanesque, Gothic, Renaissance and Baroque periods. Čiovo Island is easily reached via the connecting bridge and is also well worth a visit. Bokamorra may be a pizza restaurant, but it’s also a fine eatery that prides itself on only using high quality, locally sourced ingredients to create classic Italian inspired pizza. 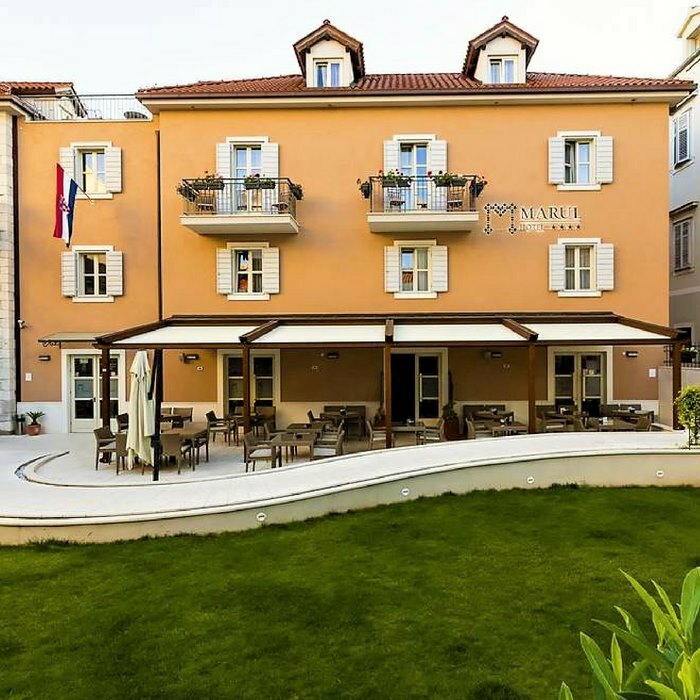 The stylish pizzeria restaurant has a lively atmosphere and is one of the most popular places to dine out in the city of Split. At the pizza mecca you can sample some fantastic, new topping combinations. The restaurant also has a great cocktail list. The modern interior features banquette and counter seating options. 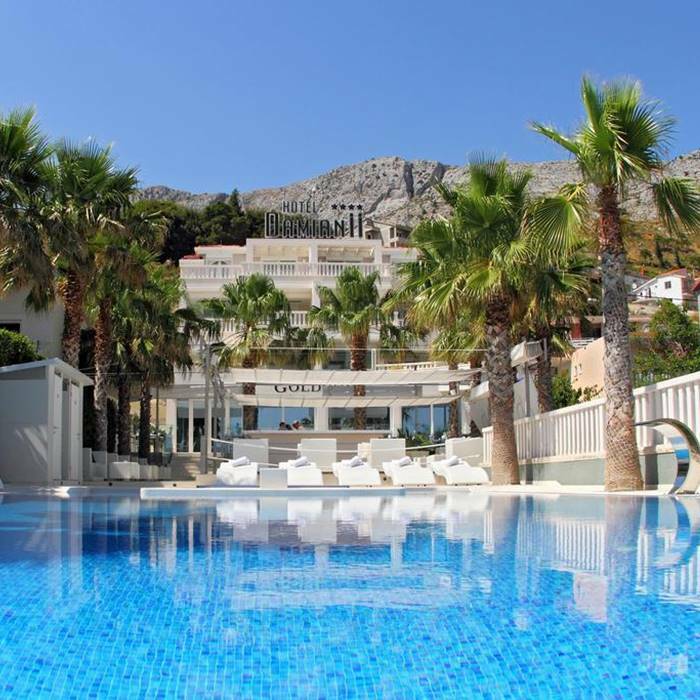 Ma:Toni is situated close to Bacvice beach and offers vibrant Mediterranean fusion cuisine for you to enjoy. The stylish modern restaurant is located within a cosy traditional cellar and features a domed ceiling, exposed brickwork and decorative metalwork. On the menu you will find hearty and tasty Dalmatian food served in a contemporary way. There are also plenty of vegetarian and vegan options on offer. To compliment your food choices, there is a great selection of wines and beers available. 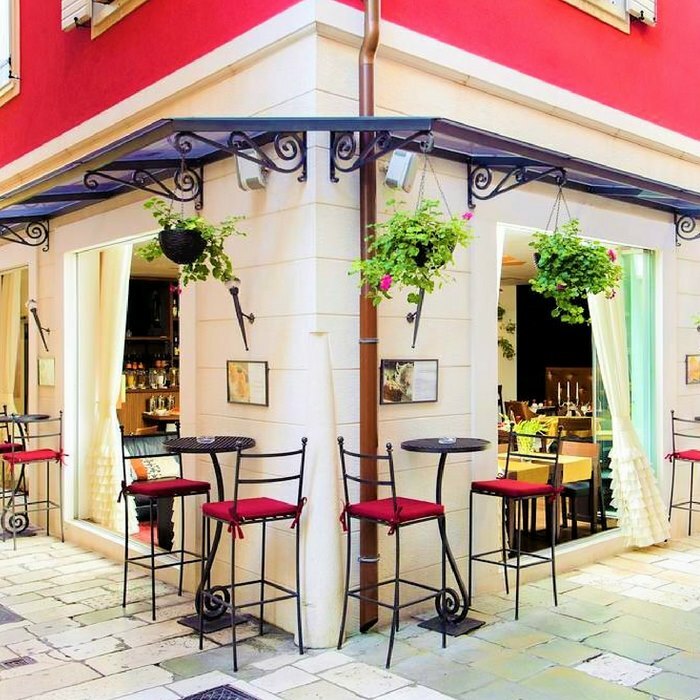 To enjoy an upscale dining experience in Split, a visit to Bokeria Kitchen & Wine is highly recommended. The restaurant is situated on a prominent street corner in the heart of the city. The classy interior shows off walls that are lined with wine bottles and liquor, a huge chandelier and a mosaic tiled bar. Seating is available inside or on the alfresco terrace. The menu features classic Mediterranean inspired dishes made with fresh seasonal produce from the local market. Portofino is a stylish modern steakhouse that delivers five-star quality food and ambience. 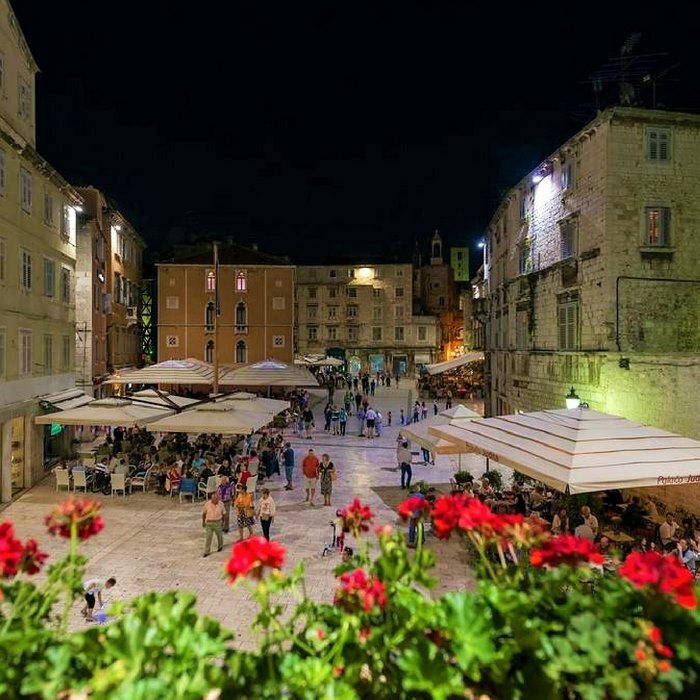 The chic restaurant is located on a square in Diocletian’s Palace labyrinth. 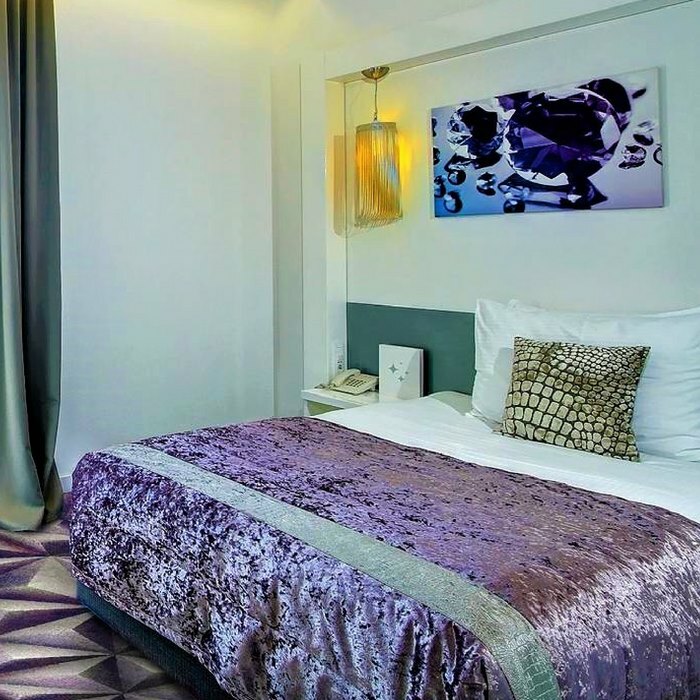 The décor is elegant and upmarket, and the service is warm and friendly. You can dine inside or in the lovely outdoor courtyard. On the menu, there are delicious pasta dishes and steak and seafood specialities. Whilst you make up your mind you can enjoy a complimentary amuse-bouche. The restaurant also has an extensive wine list.